Distributor / Channel Partner of a wide range of products which include draglines machine. 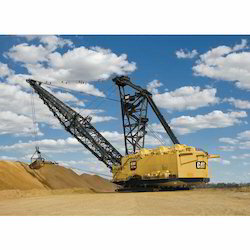 To net propelling demands of our esteemed clients, we are offering a vast spectrum of Draglines Machine. These walking draglines are developed by using finest material and leading technology by our accomplished professionals. The offered walking draglines are commonly used in strip-mining operations to remove overburden above coal and more recently for oil sands mining.